In the Payments section, you can set up payment integrations for your free online order form, such as details regarding the type of payment you accept, assign prices to your items and customize notifications. Click on the links below to find out all there is to know about forms with payment integration. Payments are available on the Platinum plan or higher. Feel free to use any of these payment processors. You can add as many payment processor you want on the same order form. Do you have the ability to set-up volume pricing? Example: Price for 4 or less is $59 ea., 5-9 is $49 ea., and 10+ is $39 ea. I basically need the customer to be able to enter the quantity amount they want to purchase and if the quantity is at a discount level, the discount will auto apply. Settings->Payments->Calculations tab and that code will have to be entered manually by the user before submitting the form and be redirected to the Payment Processor. Unfortunatelly, the platform doesn’t support a feature where the discount is automatically applied. The scenario can be achieved indeed by using the Conditional Logic section on the form. One of the possibilities is to assign values to the fields for each of the numbers of purchases a user makes. For example: for the first 1-4 number of purchases you setup the same value ($59) and then for the ones from 5-9 ($49) and so on. After you assign all the values, you use the Field Rules to show up the price according to the number of items that is being chosen. If you require further support please contact us at support@123formbuilder and we will gladly help you setup your scenario. I can set up a radio button from the client to set up a 12, 24 or 36 month recurring payment. How do pass that number to PayPal? In the PayPal configuration tab for the recurring payments the maximum value accepted is 12 months. Unfortunately such a long period of time is impossible to setup. If you need more information, please contact us at support@123formbuilder.com. I am currently using the free version of 1,2,3 FormBuilder. I don’t need to add a secure payment portal right now because I only need to display a cost summary of the items ordered. Based on what I have read it should be free. I have assigned values to all my fields but I don’t know how to link the “submit” button of my form to the cost summary that should display after submitting the form. There is only a thank you page showing up and payment summary is not among the options offered which are: thank you page, report, webpage, quiz results etc. How can I link my form to the cost summary with a free version? 1. Our personnel generates an invoice record in our application (which is built in Quickbase). 2. Customer receives an email with a PDF attachment of the invoice, along with a PAY NOW button. 3. Customer clicks that button, and is taken to a web page where they can pay the invoice, using credit card or ACH. Could this be a 123formbuilder, with an invoice number and prefilled payment amount? After payment it would be nice to redirect them to our website. 5. Our application receives a notification (via API call) that an invoice has been paid. 6. Our application sends a thank you receipt to customer. I can take care of 1, 2 (except for the link in the PAY NOW button), and 5. I need an application that can help me formulate the link underlying the PAY NOW button, as well as a payment page. It would be nice if the customer could save their info for future payments, since many of our customers are repeat. Regarding the PDF attachments, you could create a custom autoresponder when going to Settings –> Notifications –> Form User and attach the file there. Your users will receive it after submitting your form. If you need to receive payments through your form, you can integrate them with a payment processor starting with our Platinum plan. All the credit card information for your users to add will appear after submitting the form. This is the best way for the form to send all the information to the payment processor in order for your users to complete the payment based on the choices selected on the form. The receipt will be sent from the payment processor’s account that you integrated with your form. Also, if you are using PayPal, for example, you can enable the recurring payment for it, which means that your users will automatically be charged once in a while, according to the option set up. For redirecting the users back to your web page, you can use the Thank You Page section of the form. Please do not hesitate to contact us at support@123formbuilder.com for more information regarding your scenario. Is there a way to prevent a form from being submitted without payment? Unfortunately, payments are triggered only after the form is submitted and not before. 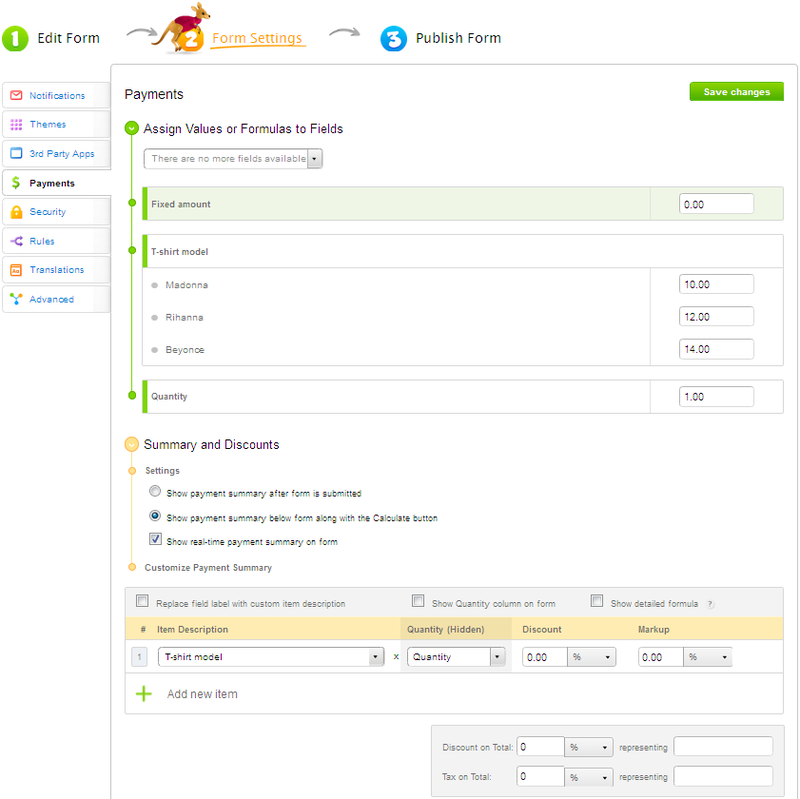 If you want to make sure that your form users pay you after submission, leave them instructions on the form on how the payments will be processed and what they must do to successfully complete the payment on both ends. It would be nice to have such a high-calliber payment system as Square. Can we expect this in the near future? We already have a request regarding a 123FormBuilder – Square integration. Follow this link http://www.123formbuilder.com/docs/square-payment-integration/. You can vote this request when logged in your 123FormBuilder account. If the request receives enough votes, we will add it to our To Do List. In the Features Request section you can suggest new features for our platform. The suggestion will be published in order for other users to vote it. Take a look at our existing requests here http://www.123formbuilder.com/docs/category/documentation/feature-requests/. Can form users complete payments only if their submissions are approved? Can I display the payment summary in real-time? Can form users edit submissions after payment? How to use sandbox for testing payment processors? How to create a complex order form?